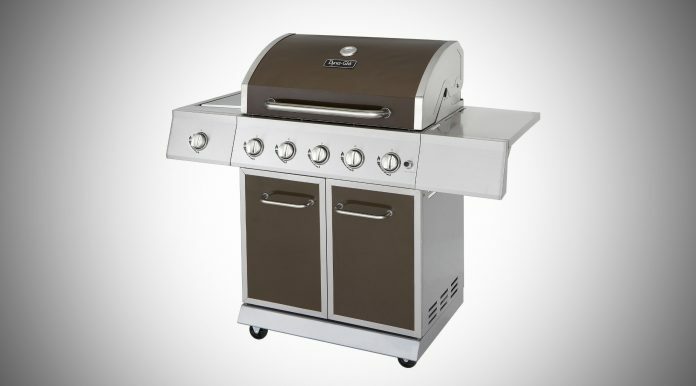 If you are serious about grilling and would refer to yourself as a grill master then you would undoubtedly want a grill with lots of cooking space and lots of burners. In that case this Dyna Glo 5 is definitely worth your consideration thanks to its 5 burner set up, you could be grilling for your whole neighborhood with all that cooking space, okay that may be a little exaggerated but I think you get the point. Anyway, let’s get onto my review to see how this grill actually fairs. First off let me talk about the design and build quality of this grill. The grill looks amazing, it is mainly built from a stainless steel and I mean almost everything, even the cooking grates are made from it. The stainless steel looks fantastic and should be very durable in the long run. For the design, you have the main body of the grill alongside 2 side panels which can be folded down for easier transport or when storing it over the winter or whatever else. You also have wheels on the buttom which allow you to easily move the grill as you need to. In terms of cooking – the cooking area is rather large and you shouldn’t have any problems with a lack of space. When you have all the 5 burners running at once the grill can reach temperatures of over 600F and it seems the heat is well distributed and there aren’t any weak spots. I also like the ability to only run a few of the burners at once and once some food is finished cooking I can move it unto the burners area that is not turned on and that keeps the food warm. For the cooking, it cooked everything really well and evenly, it also had a nice searing effect as well. Of the 2 side panels one of the them has a side burner which is convenient for cooking extras like vegies or a sauce or anything you like. 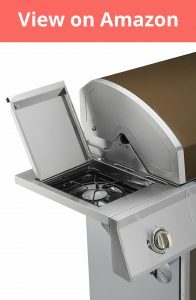 The main compartment has the 5 burners and a hood which can cover the grill to get the maximum temperature or to keep the food warm, it also keeps the grill in good shape if you are storing it outside. I want to make a brief note on the set up. It took me just under 1 hours’ time to get this grill set up – the instructions are well laid out and easy to follow. For cleaning this grill is great. The interior is coated with porcelain which makes for cleaning it very simple. The thing that I really appreciate about the cleaning is that the grill plates, the burner plates and the bottom of the grill can all be removed. This makes cleaning it 10 times simpler because you have easy access to all the nooks and crannies. Also, because everything is made of stainless steel they are easier to clean than other metal alternatives that I have used in different grills. One negative worth mentioning is that is grease tray is a bit flimsy and I could see it becoming worn out after a couple years of usage. One easy fix is you simply cover the tray with aluminum foil before cooking – this will keep the tray in much better condition and it will definitely last longer because of it. 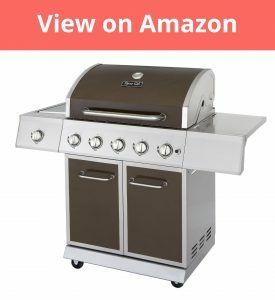 Overall this grill is a great buy – you get a quality big 5 burner grill for such low price point, its an easy recommendation for me to make!